Please type your desired tags, e.g. Biochemistry and Chemical Biology, Public and Nonprofit Management, Communication Sciences and Disorders, Critical Infrastructure, MRI, Biochemistry, Pathobiology, Nanosafety, ChIP-seq, Online Education, Information Systems, 19th & 20th - Century American Literatures & Cultures, Management, Appalachian Literature, Poetry, and etc. 2004–2004	Dieckmann, Gregg R., Alfonso Ortiz-Acevedo, Harsha S. Kolla, and Matthew Junker. 2004. Modulation of Metal-binding Affinities and Reactivity with Alkylating Agents through Engineered Changes in the Zinc Ribbon Protein L36. Oral presentation at the American Chemical Society, Spring National Meeting: session Bioinorganic Chemistry, March 28-April 1, in Anaheim, CA. 2002–2002	Yehia, Hadi, Ray H. Baughman, Gregg R. Dieckmann, Rockford K. Draper, Inga H. Musselman, and Paul Pantano. 2006. Investigating the Oxidative Stress Response of HeLa Cells Exposed to SWCNTs. Presentation at the American Chemical Society, Spring National Meeting, March 26, in Atlanta, GA. Controlled Assembly of Carbon Nanotubes in Aqueous Solution with Designed Peptides. 2003–2003	Dieckmann, Gregg R., Alfonso Ortiz-Acevedo, Alan B. Dalton, Joselito Razal, Jian Chen, Edgar Mu?oz, Inga H. Musselman, Ray H. Baughman, and Rockford K. Draper. 2003. Controlled Assembly of Carbon Nanotubes in Aqueous Solution with Designed Peptides. Oral presentation at the 18th American Peptide Symposium: session Material & Drug Design, July 19-23, in Boston, MA. Biopolymers, 71(3), 300 - 300 O71 (2003). 1991–1991	Dieckmann, Gregg R. 1991. Critical Thinking and Achievement in General Chemistry: Reaching and Teaching Large Student Populations. Oral presentation at the National Meeting of the American Chemical Society: session Computers in Chemical Education, August, in New York, NY. Abstracts of Papers of the American Chemical Society, 202, 81- CHED Part 1 (1991). 1. June 11, 2003, Princeton University; Princeton, NJ, Session "Biophysical Chemistry"
2. April 1, 2004, Anaheim, CA, Session "Environmental Chemistry"
Two University of Texas at Dallas faculty members have earned The University of Texas System Board of Regents’ highest honor. 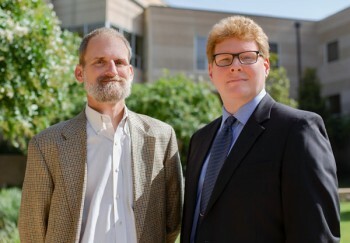 Dr. Gregg Dieckmann, associate professor of chemistry in the School of Natural Sciences and Mathematics, and Dr. Peter Ingrao, clinical assistant professor of literature in the School of Arts and Humanities, are recipients of the 2018 Regents’ Outstanding Teaching Award (ROTA). They are among 27 ROTA winners from the UT System’s 14 academic and health institutions who will be recognized at a dinner Thursday, Aug. 9, in Austin. Each honoree receives $25,000. 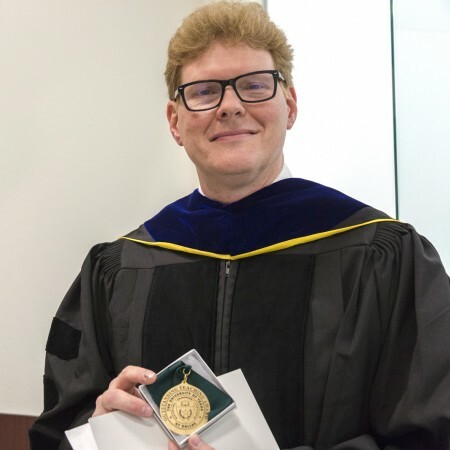 The School of Natural Sciences and Mathematics has honored Dr. Gregg Dieckmann with the 2010-2011 Outstanding Teaching Award for his efforts in encouraging students and creating a successful learning environment. Dieckmann, associate professor of chemistry, said he appreciated the recognition from students and colleagues for something he loves doing. 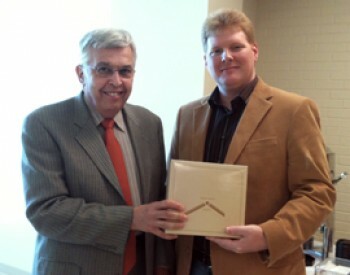 He has taught at UT Dallas for more than a decade.